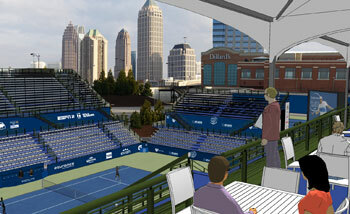 Fans will enjoy Atlanta's skyline from their seats in both courts. The BB&T Atlanta Open announced today the signing of Atlantic Station as its tournament site under a multi-year partnership. The agreement brings the world’s top tennis players from the ATP World Tour to a central, high-traffic area of the South’s largest city. Next year’s tournament will run July 14-22 – the third year the event has been played in the Atlanta area – and is the first ATP event of the 2012 Emirates Airline US Open Series. To transform Atlantic Station into the BB&T Atlanta Open site, a minimum of three competition and three practice tennis courts will be built on the 138-acre complex. Stadium Court and the Grandstand Court will be located in the site's northeast corner. Two hard courts will be laid down with two large sets of grandstands that will accommodate more than 4,000 fans on Stadium Court and more than 900 on the Grandstand Court. 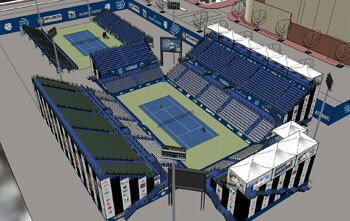 The main tennis area will have exposure to more than 500,000 vehicles per day. Court 1 and at least three practice courts will be built just south of 17th Street. Central Park, located in the middle of Atlantic Station, will be the site of Family Zone. A tennis court will be built here and will be used for family events and USTA 10 and Under Tennis programs. "We’re thrilled to be able to bring the BB&T Atlanta Open into the heart of the Midtown Atlanta," said Bob Bryant, Tournament Director. "Atlantic Station is the ultimate location that brings together a thriving entertaining city atmosphere with some of the world’s best tennis. Giving Atlantans an opportunity to experience 140-mph serves indicative of today’s powerful and athletic men’s game while also being able to see the city buildings and skyline is an awesome combination. We could not ask for better partners than the City of Atlanta and Atlantic Station"
"The BB&T Atlanta Open have now come to the South’s premier city and I couldn’t be more pleased for the citizens of Atlanta and surrounding metro community," Mayor Kasim Reed said. "Atlantic Station is a perfect location for this outstanding summer event and it provides access with convenient parking and nearby MARTA for the thousands of tennis players in our city. This event brings a significant economic impact to Midtown Atlanta and exciting entertainment for us all." The BB&T Atlanta Open announced today 2003 US Open champion and former No. 1 Andy Roddick, 2010-11 ATC finalist John Isner and US Open mixed doubles champion Jack Sock (with Melanie Oudin) have committed to play in the 2012 tournament. Isner has signed a multi-year deal. The ATP formally awarded the ATP 250 sanction BB&T Atlanta Open to the USTA Southern Section in December 2009. The tournament field and schedule will be similar to last year’s with a 28-player singles draw and a 16-team doubles draw. Four of the singles players will come from a two-day qualifying tournament on July 14-15.